StackTrace is a module you can use to inspect what an application is doing internally while it runs. It provides an interface for monitoring method calls, which you can use to build monitoring and debugging tools. There are three types of event, which tell you when a function is called, when a function returns, and when an error is thrown. leaf – Boolean indicating whether the call is a leaf; it’s a leaf if no other method calls are logged while it is running. This is always true when a method is first called. This event fires when an exception is thrown. The data object is just the error that was raised. Since tracing incurs a performance cost, jsclass does not trace anything by default. When you want to trace a module or class, you pass a list of the modules you want to trace to Method.trace(), and use Method.untrace() to stop tracing them. There is a logger you can use to print the call stack to the Console. 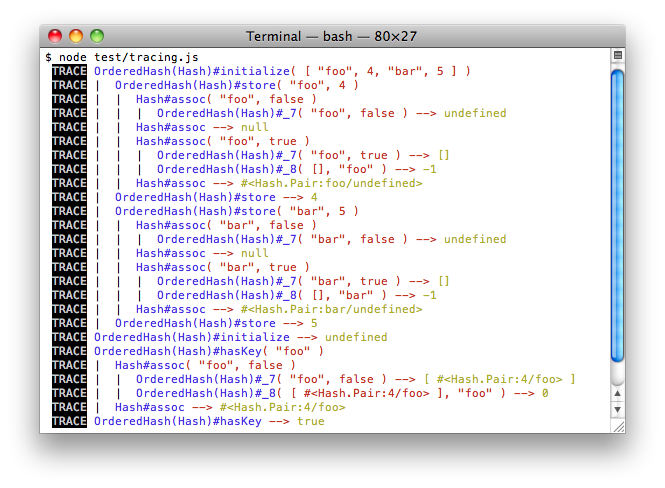 To use it, just pass a list of modules to trace and a function to Method.tracing(). This enables tracing for the given modules, runs the function, then disables tracing again.